Won lost his mother at a young age, and soon after had to accept a strange woman as his stepmother. Later when he was just starting puberty, he was told he had a half-brother by another strange woman. Young, confused, and never properly loved, Won only learned to be wary and distrustful of the world. He learned he had to fight to protect what he had and what he felt he deserved, without properly considering what he really wanted. In the last episode, Tan said he knew why his father was putting him in the fighting ring against his brother- so that Tan wouldn’t have any other dreams. Won also taught Tan to never dream before he was sent off to the U.S. 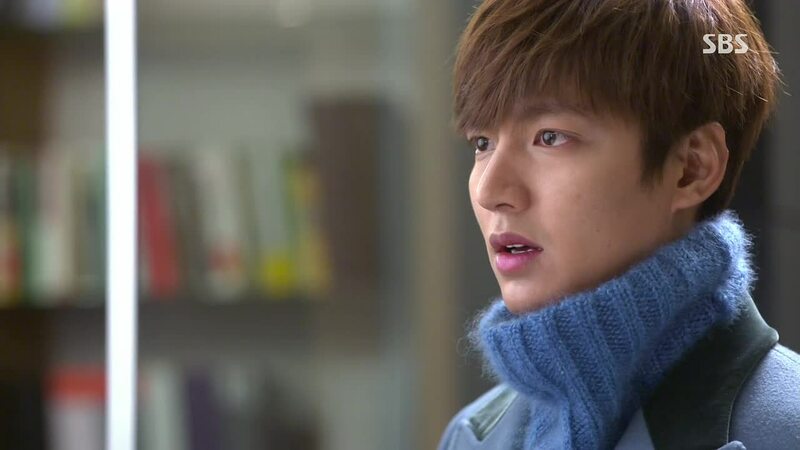 Yet, because of Eun Sang, Tan is dreaming of a world different than what he was born into and told would never change. He is changing his world little by little according to his dreams and hopes. What does Won dream about? What does Won want for himself, apart from the Jeguk Group? Scared and defensive about something his younger brother never expressed any desire for, Won has lived his whole life to become the head of Jeguk. But is that what he really wants? What is really going to make him happy? Won remains deaf and blind to Tan who keeps trying to reassure him that there is love for him- love that might make up for what his father couldn’t give him. 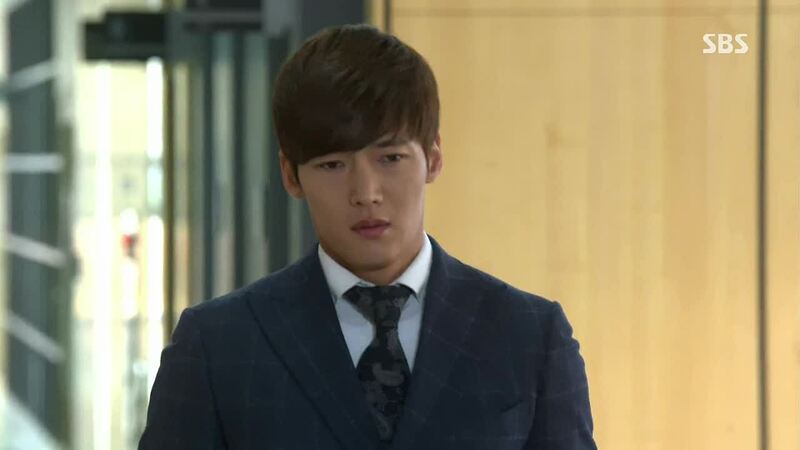 How far will Won go before he realizes what he is missing out with Tan and Hyun Joo? At BN and CY’s party. Tan cups ES’s face in his hands and softly kisses her on her forehead. R is outside, angrily trying to take off the corsage on her wrist. YD approaches her and roughly takes it off for her. He’s mad that R called ES to the party as a catering service. He says he will let this one pass since ES revealed her secret with her own mouth, but he warn R that this is the last time. R asks if ES knows how zealous YD is with anything concerning ES, and he replies of course not- it would be embarrassing. He is about to go back in, but MS being the good friend rushes out, trying to distract YD. Unfortunately, other students come out gossiping about the kiss, and YD and R both end up finding out anyway. YD leaves. R is about to go back into the party, and runs into HS. He asks why she is out here. R replies she was waiting for HS- she really wanted to see him. HS is confused, but gets distracted by a call from HJ. She yells at him for not taking the college entrance exam. She asks where he is, and he replies he will tell her only if she comes alone. At the Kim house, KA asks ES’s mom to keep an eye out while she tries to open the chairman’s safe. She tries to open the safe with birthday passcodes (Won, Tan, KA, his own, the founding date of Jeguk), but none of those works. ES’s mom goes all CSI (Crime Scene Investigation) on us and dusts the fingerprints. Turns out the passcode is Won’s mom’s birthday. KA looks a little disappointed. Inside the safe, she finds an envelope. It has the spy photographs of Tan with ES, and Won with HJ. KA sees another set of pictures that shock her. Back at the party, BN, CY, Tan, and ES are asking HS about his entrance exam. HS lies about it. R comes back in, and Tan goes over to talk to her, asking CY to distract ES. Of course this pisses of BN. R asks if Tan is happy now that everyone knows he is dating a poor charity case. Tan replies that he wishes R becomes happy too. R says she can now give up on Tan not liking her, but she can’t bear seeing him become happy. She wants him to lose someone or at least grow apart from someone now that he has gained ES. R walks over to HS and kisses him. HJ comes in exactly at this moment, and HS sees her. The kiss ends, and HS asks R if she is doing this to get back at Tan. She replies it is just so his relationship with Tan gets a little weird or perhaps they stop seeing each other. She admits to having no feelings for HS. She is about to turn around, but HS stops her and says he doesn’t have feelings for her either before he kisses her. BN is pissed off for everyone ruining HER party. Hehehe. ES is stumbling home with Tan following her. Turns out MS did spike the drinks. ES is full of aegyo, and Tan is finding her hard to resist. 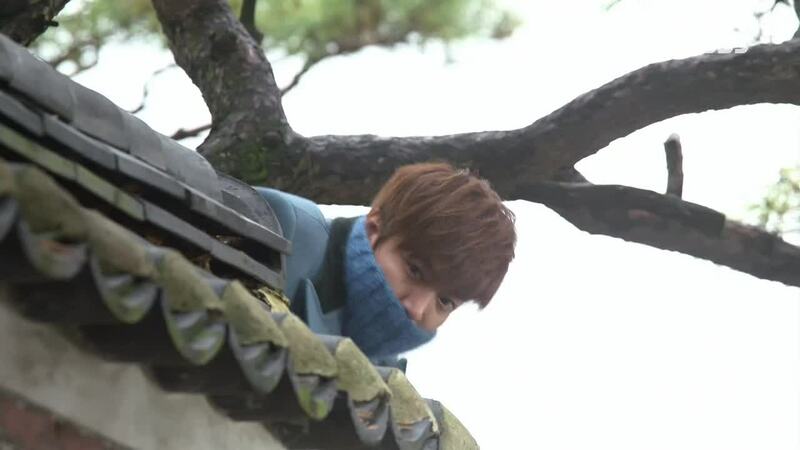 ES turns around and smiles at Tan- “Kim Tan. 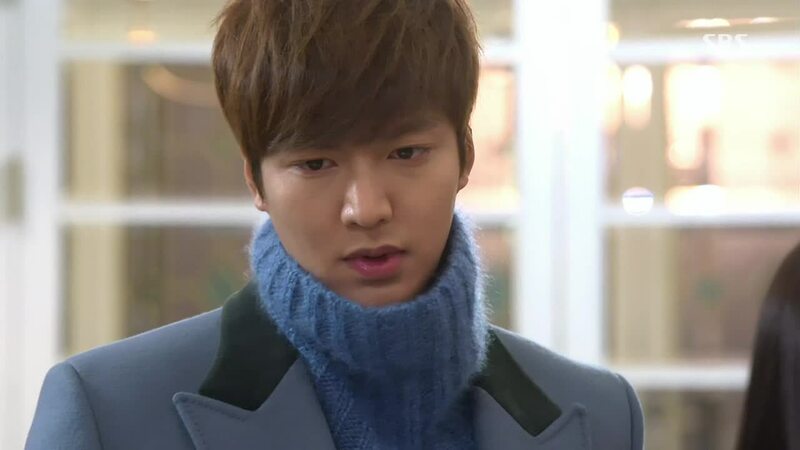 Very handsome Kim Tan.” Tan replies, obviously pleased, “Stop being cute. 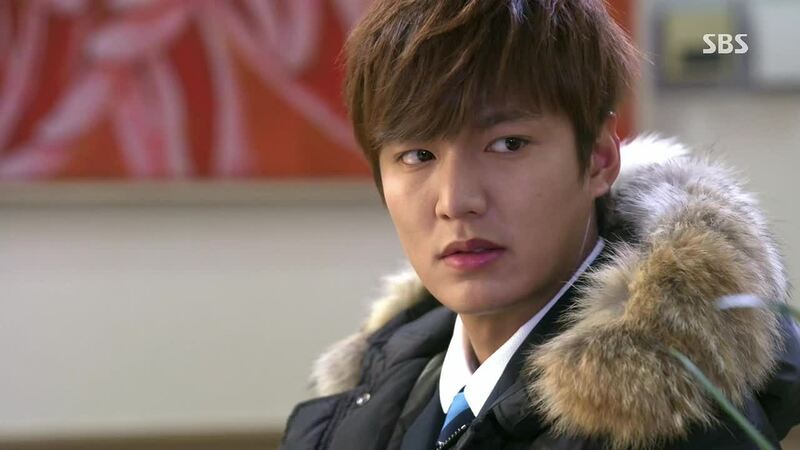 You’re very dangerous right now.” ES keeps talking- “Kim Tan who walks only looking at me. 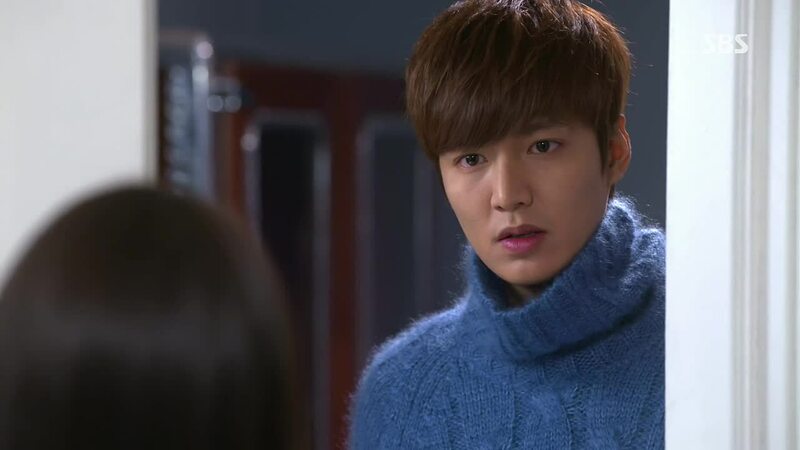 Kim Tan whose life keeps becoming more miserable because of me.” Tan turns serious and threatens to just leave her here if she keeps talking like that. ES: “I’ve come to like you. Really.” She takes his hand with a happy smile on her face. Tan worries about her cold hands, and he blows on them. Tan gets a call. Tan meets his mom at the hotel. She had called him staying it was an emergency. She tells him she has a plan to make sure the engagement happens; she wants Tan to apologize to R first. Tan replies he doesn’t want to live as a fake anymore. KA says he isn’t; he is Jeguk’s second son. Tan asks, “Then what are you? 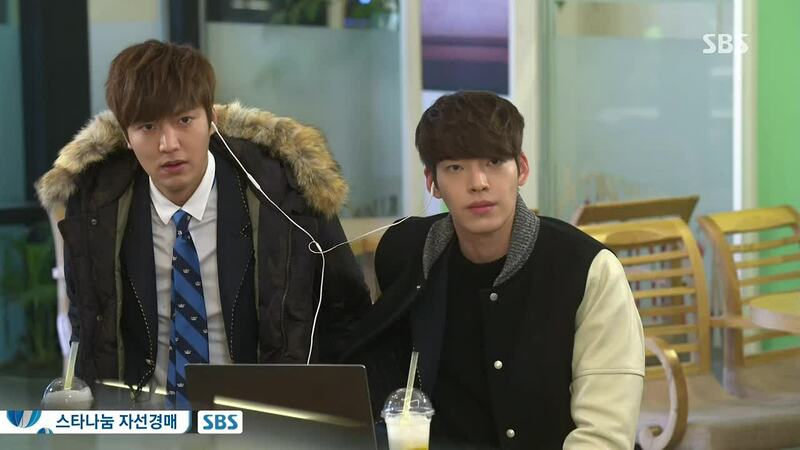 Is it not enough to just be Kim Tan’s mom? Am I nothing to you too if I am not Jeguk Group’s second son?” He leaves to go return to the hotel room. No Won. 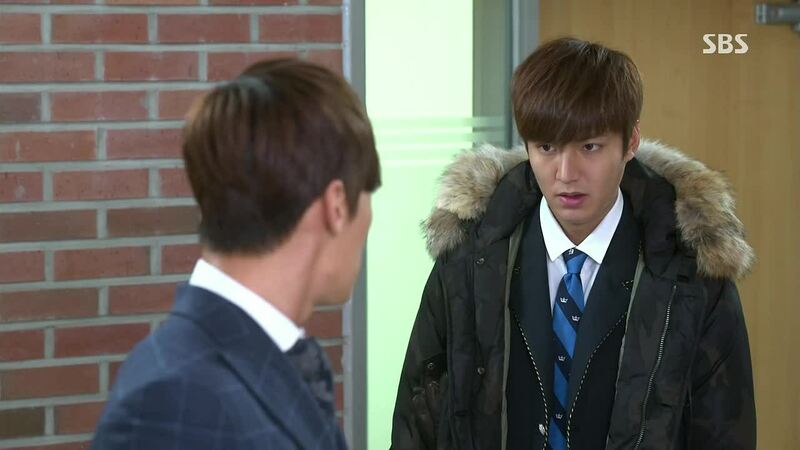 Next day at school, Tan scolds HS about not taking the exam. HS says all the other kids are looking at them because of yesterday; shouldn’t things be a little awkward between them now? Tan just sits down next to HS and asks him about his parents. HS replies that his parents just said, “You can do it. Lee Hyo Shin.” Tan asks what kind of hell HS is living in. HS says he is sorry about yesterday. He just wanted to show someone something. Tan asks, “Was it me?” Puhahahahahah! I love these two. At gym, some girls come up to ES, mad that she lied about being new money, and also dating Tan. They start ganging up on her, but YD is here to save the day, again. He scares them away. ES thanks him for being her black knight. He says he is not; if he is a black knight, then is Tan a prince on a white horse? “My face is more white.” Hehe, ES smiles, and I smile. They talk about HS for a bit, and ES points out that they are talking like this without YD using her secret. This throws YD a bit off, so ES replies that it just seems that YD doesn’t really know how to talk about himself. YD tells her to go on her way now, so ES asks if he was walking her to safety. YD complains that she never realizes the things he does for her. YD gets called out. YD and Tan are washing the windows again for punishment. They see their dad and brother coming into the school, respectively. 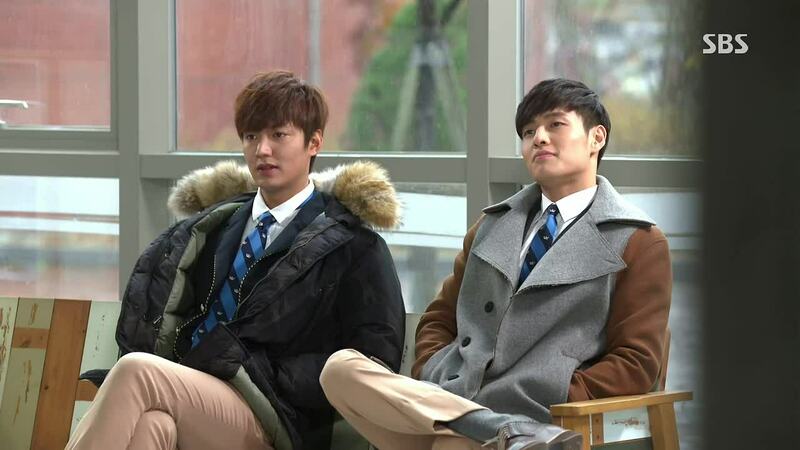 YD and Tan ask each other back and forth- did you tell, what about your grades, can you say I hit you? Everyone sits in a meeting with JS. JS tells them about YD and Tan’s grades. YD placed 98th. Tan is 100th place. Won asks JS if this is 100th place in the whole country. JS replies that it is in his grade. Out of 100 students. HAHAHAHAHA! 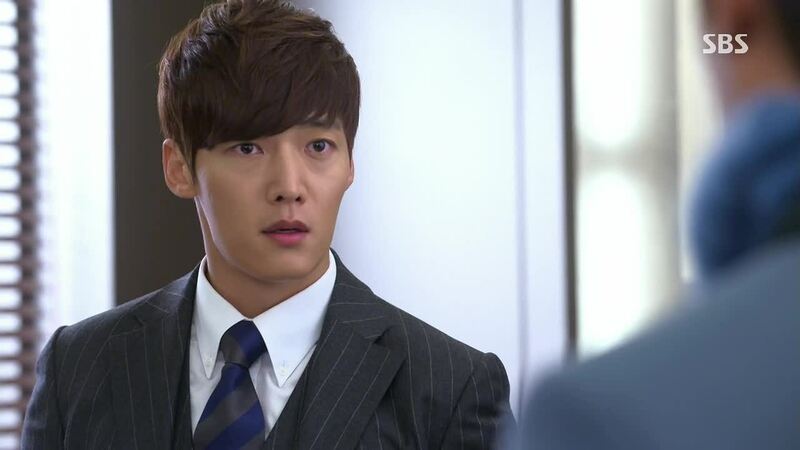 Won gives this look of disbelief to Tan. Tan’s response- “I don’t do middle.” ROFLMAO. Outside in the hallway, YD is expecting to get an earful from dad. Turns out dad is glad that YD beat Tan. HAHAHAHAHAHAHA! YD’s “Huh?” face. While Tan hangs his head, Won chides him for doing so poorly in school. He asks if Tan will do the same thing for the finals. Tan promises to do better, looking like a puppy. Won asks sarcastically, “Can you do worse?” Tan smiles, happy to see that Won cares. He thanks Won for coming, and leaves. Won sees HJ in the hallway. She is just about to pass him by when Won asks if HJ is having a hard time; she’s not looking too good. HJ replies that the students are treating her like a teacher for now because there is no news out yet that she is an orphan. Won informs her that there won’t be such a report coming out. HJ asks if Won stopped the news from coming out, but he doesn’t reply. He just walks away with a pained expression on his face. KA meets with Esther. KA wants to officially end the engagement between Tan and R- this is what she and Tan wants. She is asking for this as Tan’s mom, and because Tan and R are too young to tie up together just for business. Esther replies that this isn’t something that Tan’s side can call the shots in, since he is illegitimate. Nor is this something that someone like KA can talk about with her. The Tan’s mom she knows is only JS. KA is forced to show her what she found in the chairman’s safe- the photos of Esther and Yoon kissing. Esther agrees to call off the engagement, pissed. At school during a class, HJ gives the students an assignment to read one of these books -The Sorrows of Young Werther, The Great Gatsby, Les Miserables, Anna Karenina, Pride and Prejudice- produce a response to them in a new way. She wants them to work in a group. R complains that these are all books they already read when they younger, but HJ tells them people change, so as the reader changes, so does the book. BN and CY ask ES to be in one group together. But at the café later, ES finds out that she is in a group with YD and Tan. She asks who made this group, but seeing the response from Tan and YD, this was not their idea either. Resolved to this situation, she instructs them to watch the movie version and give at least some input while she reads the book; she can’t expect them to do any more. Instead of watching the movie, though, Tan and YD just watch ES at work. When customer is not nice to ES, both get up to help, but ES gives them a glare, signing to them to just keep watching the movie. Our two puppies both quietly sit back down. Bodyguards show up to take Tan away, sent by his dad. YD says Tan can ask for help if he wants. Tan says not today. He reassures ES, who is looking very worried, that he just going home first. 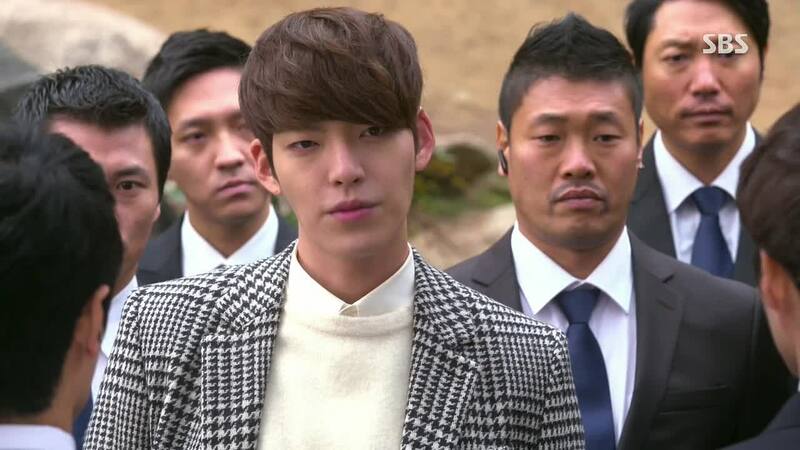 He warns YD to not flirt with ES, and then leaves quietly with the suits. ES goes back to her boss to ask if she get off work a bit early today. She starts to say something to YD, who already knows she is asking him to give her a ride home on his motorcycle. He gives her a little bit of a hard time with that, but of course he obliges, saying she is indebted to him now. Dad asks if Tan is being like this because of ES. Tan replies it’s because of dad. Dad is about to hit Tan again so KA stops him, calling out to him “Chairman” as she has always done before. But this time Tan yells at her, asking her if dad is still her boss; why does she still call him chairman, even in the house? Dad threatens Tan, asking if he has to do something to ES. Tan: “Do you not want to see me forever?” Dad orders Tan to stay in his room and to give him his cellphone. Back in Tan’s room, KA is asking why Tan just couldn’t apologize- he had his cellphone and laptop taken away, as well as being locked up in his room. Tan says, “They say when it’s dark, you can see the stars well. Since it’s become dark, I guess I can see the stars well now.” Tan then asks if KA really called off the engagement. KA says yes. “I wanted to do something you wanted. Because I’m your mom.” Tan asks if she regrets it. KA says no. “I was your mom for the first time today.” She takes his hand. “My soon took my hand and pulled me out of the room.” Tan: “That is why now I am now locked up. It’s your turn to take me out.” KA pretends she didn’t hear that last part, and just tells him to rest. Ha! Inside the house, ES notices the guards in front of the stairwell too. ES’s mom asks if they can’t move into their new place earlier, but it seems that the current tenants are still there. ES asks if Tan is locked up in his room. Mom confirms. She warns ES to stay in this room; she’s afraid ES might be the next target. ES texts Tan if he is okay, but Tan’s dad has his phone now. Dad is having a meeting with JS, KA, and Yoon. He wants JS to look for a marriage partner for Won- the best that can be had. He also warns her against riling up Won with the matter over the stock. Or else he will divorce her. Ah, Dad has spies everywhere! He also tells KA to get out of the house if she is going to raise Tan like that. 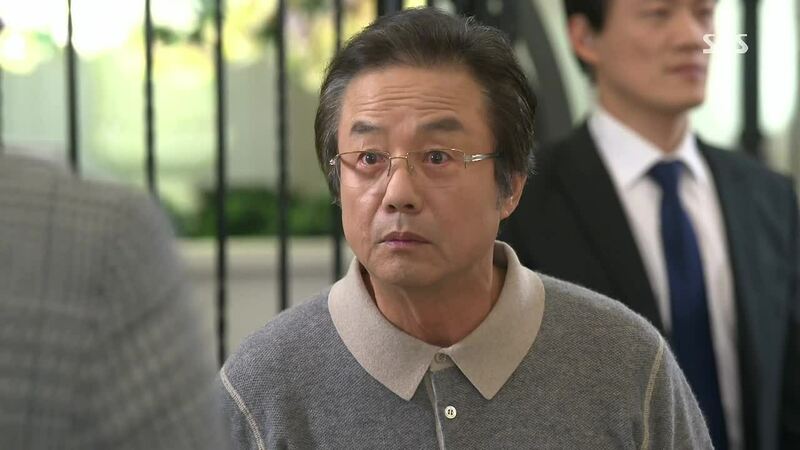 To Yoon, he tells him to prepare to Esther’s side to tell everyone about Tan, to gather all the stocks Dad set aside for Tan, and also to bring him his letter of resignation. Dad points out that Won only left Yoon in the company after taking out all the people in Dad’s line- what does this mean? Yoon understands he is being fired because he has never taken sides. Yes, dad confirms, Yoon has no enemies but he has no allies either. Dad wants Yoon to start teaching Tan again. Then he will decide whether he will accept the letter of resignation or not. Now this is a proper father and son relationship. Yoon tells CY that he has been fired. He lost a chance to be promoted too- he didn’t know that not wanting to hurt anyone was also not taking anyone’s side. CY is the supportive son, and did we expect anything less? He doesn’t know exactly what is going on, but he will support his dad’s failure. Aww, I love CY. Tan is pacing in room, trapped. There are guards outside his window. KA knocks on Tan’s door. He has locked it. She wants him to open it, worried that Tan is not eating. Tan is unresponsive. Back at home, guards are keeping Tan from going to school. Dad gives permission for the guards to hurt Tan if necessary. As long as he is breathing. Awful, awful, horrible father. Lunch time. 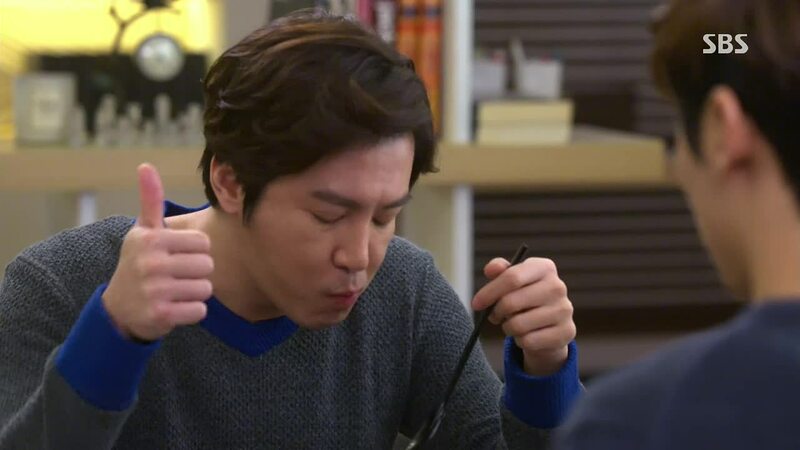 ES sees YD eating alone, and sits down in front of him in the charity case chair. Kids whisper. YD tells ES to sit somewhere else since Kim Tan always comes out of nowhere when ES sits in that chair, and that doesn’t make him feel good. ES reminds him that Tan can’t come so they should just eat. YD warns her to be scared of him; ES’s ease with him doesn’t sit well with him. The threat doesn’t work on ES. She just tells him to eat. 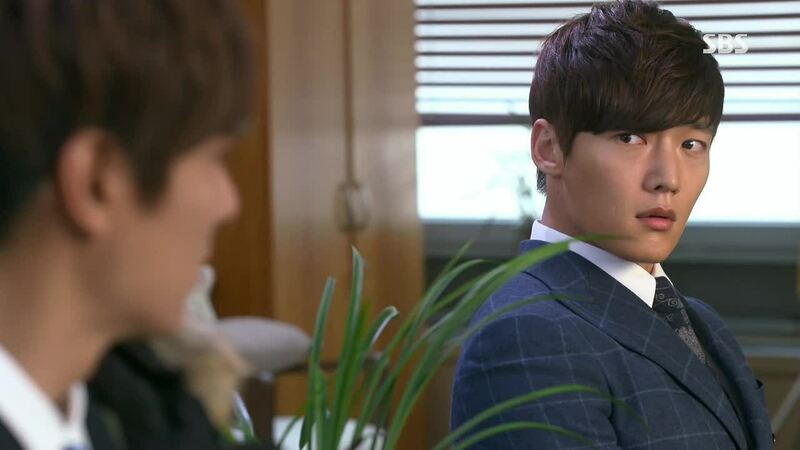 Right then, the rumors start spreading that Kim Tan is illegitimate. Rachel leaves the lunchroom immediately. YD asks ES how many guards are in front of the house. Finding out the rumors are spreading already, Dad orders his spy to release a news article about there being a battle now between Won and Tan for Jeguk, legitimate versus illegitimate, and also to make Tan officially a major stockholder. The news spreads and everyone, including JS, Won, and Esther, hear about this. YD has come to Tan’s house. He has brought his own men with him, and using his status as Zeus Hotel’s son, he gets inside the house. To Tan’s dad, he says he came to do work on the school project with his him. Dad’s face below. 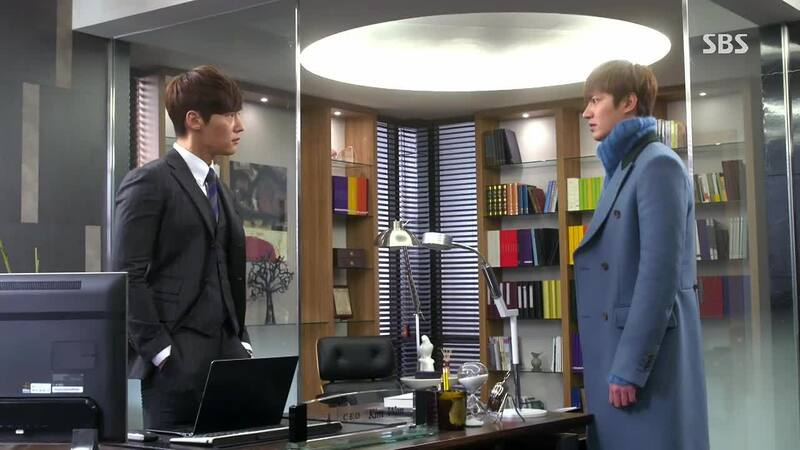 YD enters Tan’s room, and of course they don’t get to the point without some bickering first. YD informs Tan that all the news about him being illegitimate and now a major stockholder is out. Tan asks for help, in a roundabout way, to get out the room, and YD agrees, in a roundabout way, saying he likes Tan being indebted to him. And this is where I die laughing. Seriously, I almost couldn’t type the live recap because I was laughing so hard. 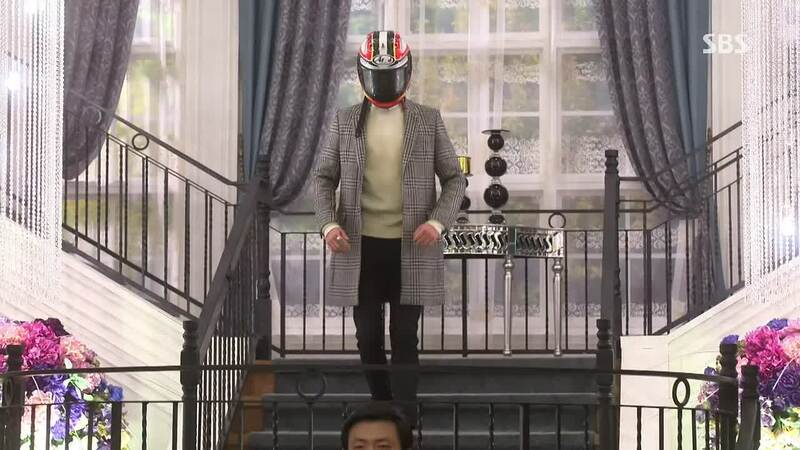 Someone dressed in YD’s clothes and helmet come down the stairs, acting all suspicious, and of course all the guards chase him. While so distracted, the real Tan escapes, and the guy who is supposed to be Tan disguised as YD is actually YD. Taking off the helmet, YD fixes his hair. I just wanted to point that out. Oh, and was this another City Hunter homage? Or does Tan really think that covering half his face is going to disguise him? Hehehehe. Won is talking to Yoon about the Tan news. Yoon informs Won that that was the last thing he had to do as secretary. Now he is unemployed. Won offers him a higher position. Before Yoon can answer, Tan bursts in. Yoon leaves so the two can talk. ES coming out of Dad’s room, shaking, just as Tan walks into the house. They have to just walk past each other, but Tan grabs her hand for just a moment before he passes her by without a word. I love this scene. Tan talks to his dad. Today is the day that he is no longer dad’s son, but Won’s enemy. He thought he could persuade Dad. He thought if he didn’t want what was Won’s, and if Won went along on his road and Tan on his, he believed the family could be at peace. But today, Dad made all his efforts go to waste. Dad explains that he is doing this for peace too. While Won is doing business, various things might happen, and when it does, people will try to take the company away in Won’s absence. Tan needs to be there to fill in the spot. The heartbreaking conversation over, Tan sits in his room in the dark. ES slowly climbs up the stairs to Tan’s room. The guards are not stopping her. As she walks up, we hear what Dad proposed to her. If she gives up Tan now, he will send her anywhere she wants- anywhere in Korea, U.S., France, anywhere. If she can’t break up with him now, she can choose something else. He will give her 2 weeks to see Tan as much as she wants. But at the end of the 2 weeks, Dad will send her where he wants. And it definitely won’t be anywhere in Korea. It will definitely be different from the U.S. and France. ES makes her decision. She continues up the stairs. ES knocks on Tan’s room. Tan opens door, and surprised, starts to ask her how she came up here, but ES quiets him. She smiles widely and brightly. And I die a little inside, knowing what decision she made. 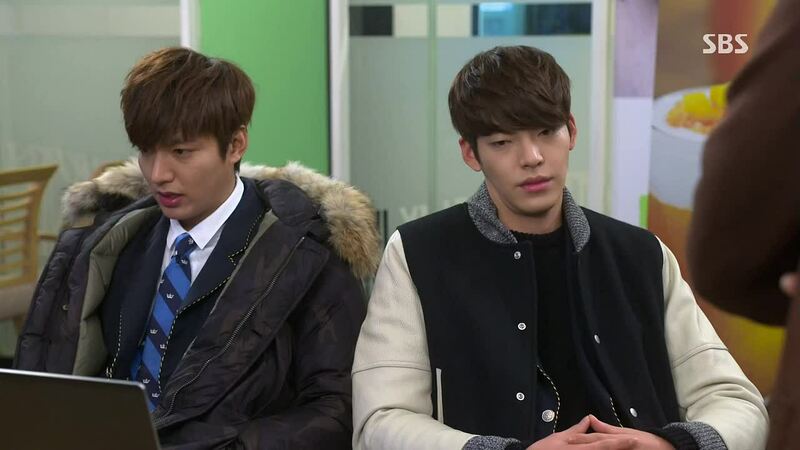 Reporter: Is Kim Tan coming to school? YD: Don’t ask that kind of question. (She is/ I am) going to get hurt. YD: I’m the third son of Jeguk. MS: I’m the youngest daughter. Dad: How far will you ruin Tan? ES: As much as the money received (can’t hear clearly). Tan: Do you even like me? Do you even believe me? ES: What am I supposed to do then? I’m so scared. Tan: Don’t be hurt in a place where I am not at. If you do that, I will really go crazy. Won: Did you hear about the president being fired? Was the reward promised by dad my position? Tan: Can you hold her here? There is no one else but you. ES: What are you doing? YD: Getting revenge for you. The culprit is in here. Won: Don’t let your guard down. Tan: I will use my everything to protect her. It’s a warning to never touch her. Happiness is brief, a family is broken, but in the darkness, the stars shine brighter. I enjoyed this episode tremendously. Lots of laugh out loud humor, tear invoking sadness, and enough plot movement, as well as some character growth. The Heirs is a romantic comedy, but honestly, the laugh counter has been a little low with this drama. I’m sure other viewers who have watched previous Kim Eun Sook’s dramas would agree this one doesn’t have the zip and zane of her previous works. Today’s episode was the funniest so far, with the combination of directing, dialogue, speed, and acting coming together in a nice balance. It also helps that there is a lot less fighting between our young friends. And who knew that Tan placing 100th would bring so much comedy throughout the whole drama. Thanks, Tan! Honestly, though, why bring the motorcycle helmet into the house? He has never brought it in inside a building before. But I’m glad he did because watching tall tall Young Do come down that stairs in that helmet made me laugh so hard. Still laughing just thinking about it again. R kissing HS was stupid, and HS kissing R was stupid, especially when the people they are trying to hurt do not care at all. I think R and HS knew that, yet they still had to act out the hurt they felt inside. I understand, but it wasn’t a smart move from either one of them. We have our pairs: HS and Tan, Tan and YD, YD and MS, CY and BN, BN and YS, BN and ES, ES and CY. Poor Rachel; she doesn’t have anybody. HS has really been the only one who has seen Rachel at her vulnerable moments and even her smile. Perhaps these two can find comfort with each other, especially considering the type of parents they each of have. We can really make a comparison today between Tan’s mom and Rachel’s mom. Ki Ae has never been able to act like Tan’s mother his whole life, yet in one single move, proved herself to be a mom worthy of that title. Esther, on the other hand, had the whole of Rachel’s life to be a mom, yet she never cared once what her daughter wanted. Neither does Hyo Shin’s parents. Their pride, their desires, their dreams come first before their child’s. And Hyo Shin and Rachel can be crying as much as they want- their parents just won’t see or listen. Neither does Tan’s dad. Compare him to CY’s dad who is an excellent role model to his son, and has a son that resembles him and looks up to him. I’m very proud of Ki Ae who had originally planned to use those photos of Esther to blackmail her into keeping the engagement. But after Tan asked her if it wasn’t enough for her to just live as Kim Tan’s mom, not the mom of Jeguk group’s second son, Ki Ae changed her mind and used the photos to protect her son after the engagement is called off. I’m very, very proud of her. 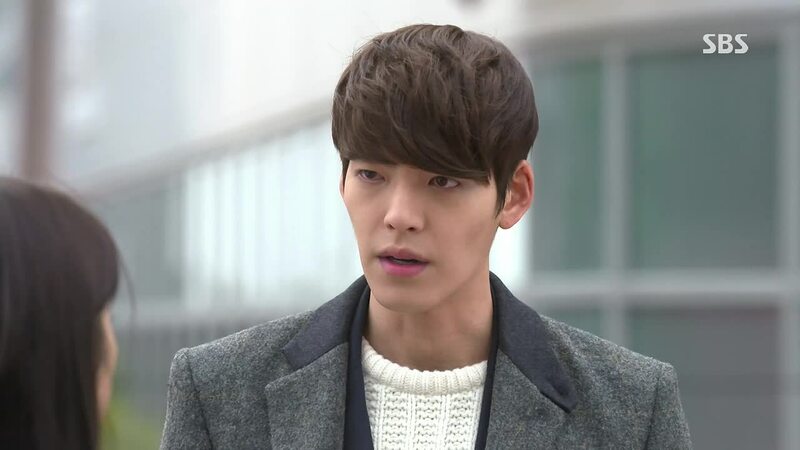 Eun Sang is drawing that line between Young Do and her very firmly, treating him as a friend only. Nothing more and nothing less. She’s not scared of him anymore either. Young Do knows what she is doing, and he doesn’t want this. He wants her to be on guard because being friend-zoned means there is no chance at all. 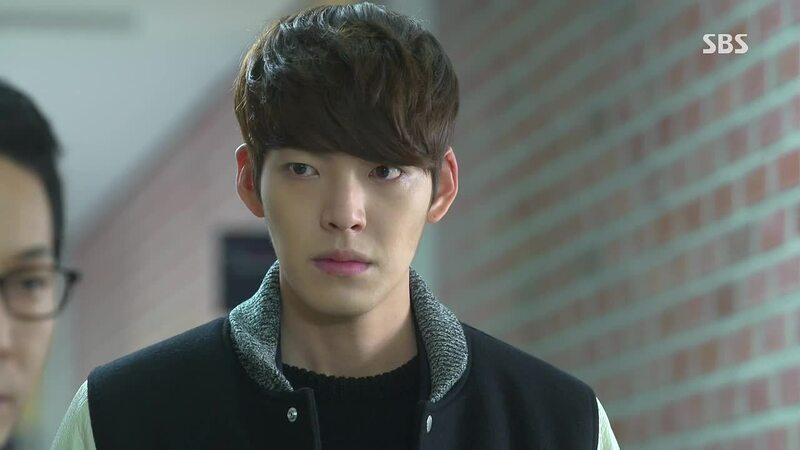 He is not her friend, not on her side, and not on Tan’s side either, but he can’t help but get involved because it hurts him to see Eun Sang hurt. What does one do when being on someone’s side means you lose that person? 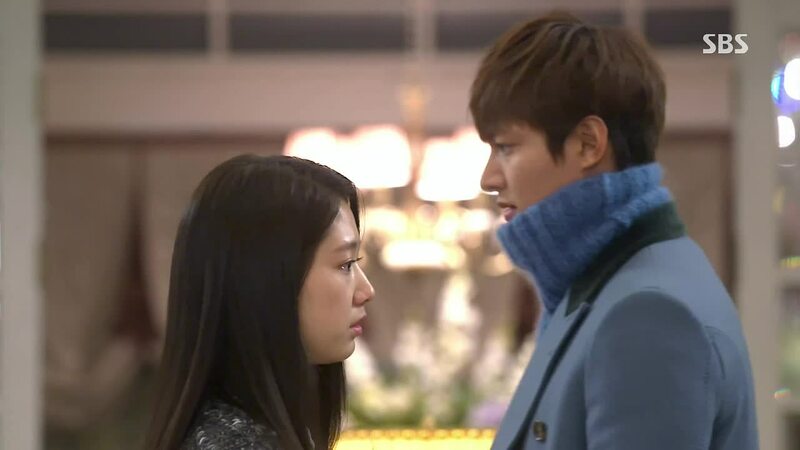 My dear Tan and Eun Sang. I will save my words for tomorrow’s episode where I’m sure we will have many painful scenes. 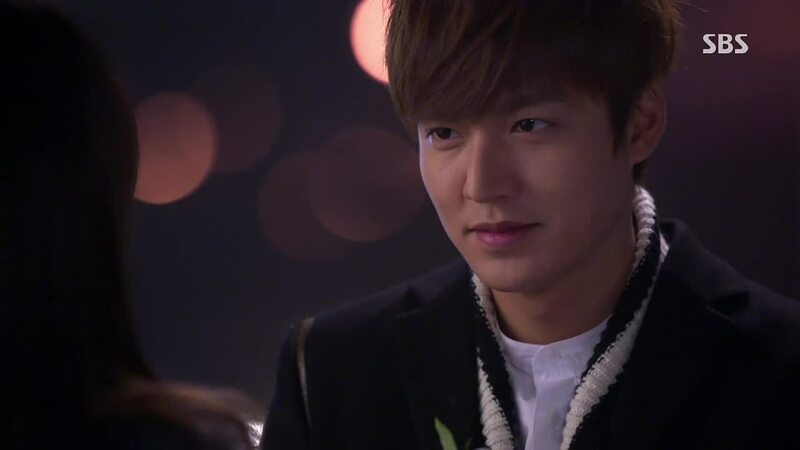 As I wrote above in the recap, I died a little inside when Eun Sang smiled liked that in front of Tan. Perhaps this will help me be a little less sensitive tomorrow. 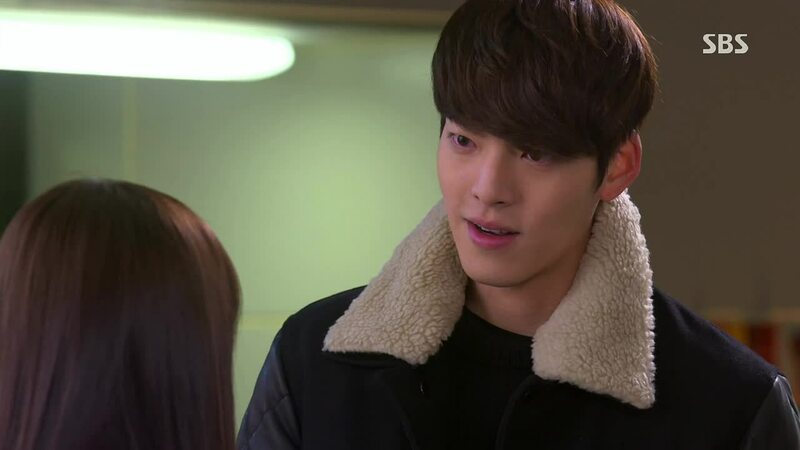 Since I get a hold of your blog I have this process on how to watch “Heirs” ..first I read your blog then while waiting for the english sub …I watched the raw episode and used your blog as a reference….so when I watch the episode with eng. 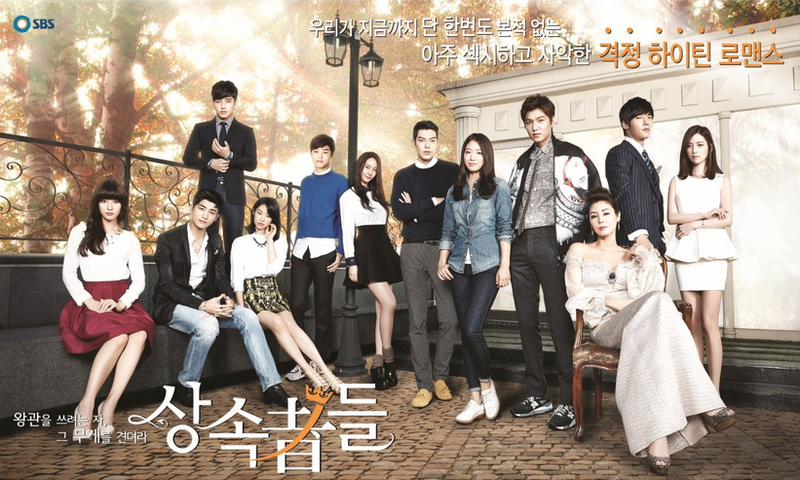 sub I would really enjoy it…so I thank you in behalf of all the fans of “Heirs” ……God Bless!!!! Jooni, I just finished the english subbed version. But the scene where ES recalls Daddy Kim’s words were different. It says that the second option is ES is allowed to see KT as much as she want tonight, but she won’t be able to choose where to go. Just wondering which one is the correct one, 2 weeks or 1 night? Appreciate your feedback here. Thanks in advance! I rewatched the preview lots of times but I still don’t get the scene where Tan flips through Eun Sang’s book right before he says :Do you even like me? Do you even believe me?” Just asking was that an air ticket or was that the money she asked for? 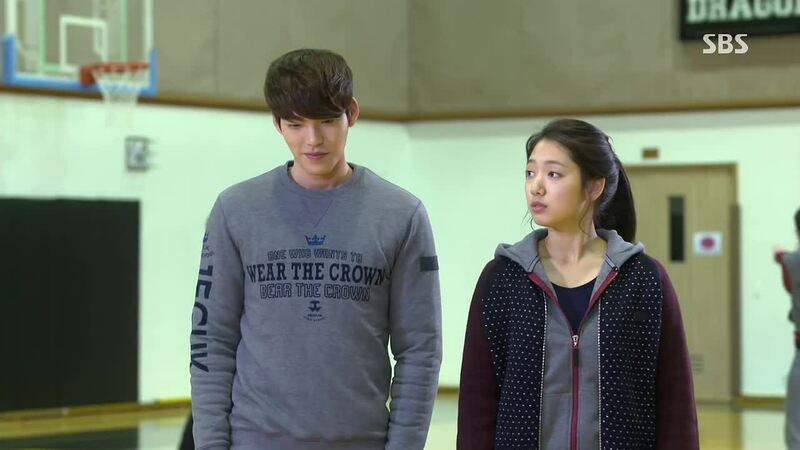 Anyone notice YD is wearing shirt ‘Who bear the crown, bear …..” something like that? Scene at gym with ES..
YD getting all tame and nicer! @erma cutestamoi: yes I did! the title of the drama 🙂 i would like a shirt like that too :P.
I also want that kind of shirt.. so cool and nice. Omg. really? Its going to happen today. Its even hard to see da stills. I dnt know how im going to see todays episode. I hope this scene come as soon as episode starts and they get back together today itself.otherwise I cant imagine waiting for da whole one week. Hi Joonni!! Thank you so much for your recap and please do rest well!! Personally, I think this episode especially has a lot of hidden emotions. Emotions that we might not have expected from the characters from previous episodes. For example, Rachel’s breakdown in front of her mother was rather shocking to me as I don’t think I saw Rachel as someone who had genuine feelings for Tan. And of course KA taking on the role of Tan’s mother was definitely one of the most touching scenes. 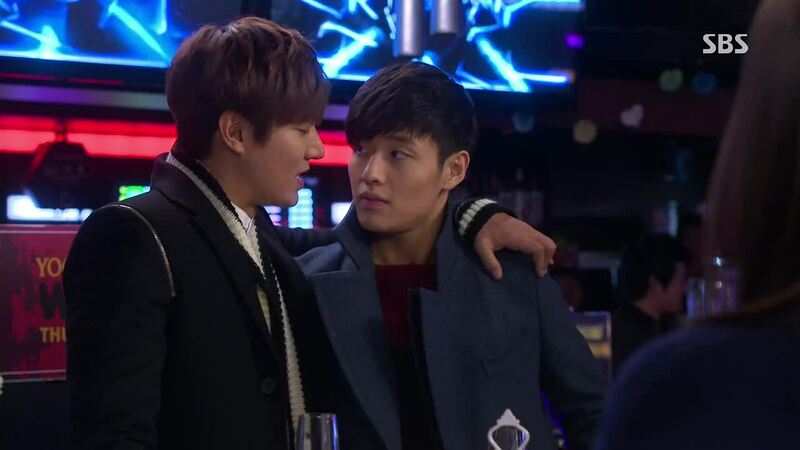 I’m definitely looking forward to more bromance scenes between Young Do and Kim Tan ( those two are so adorable!!) 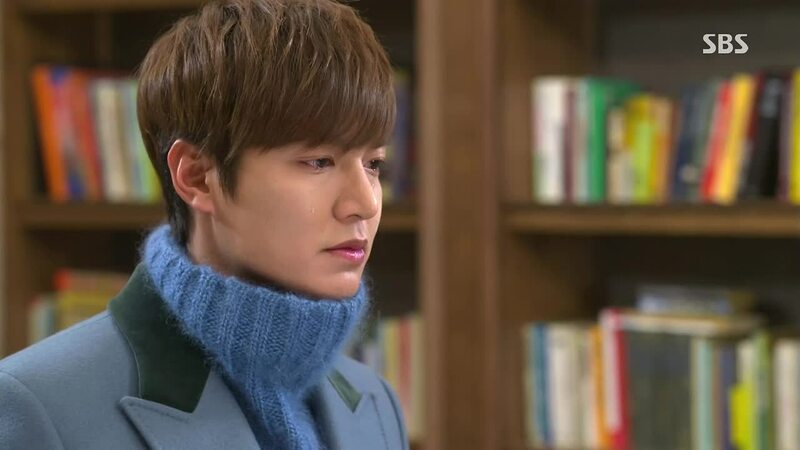 I’m rather excited to see how the writer will develop the relationship between Kim Tan and Eun Sang and also between Kim Tan and Kim Won and how she will actually bring it all to a close since the drama is bound to end soon. I’m definitely surprised by the actors’ abilities as I’m rather new to the world of Kdrama. 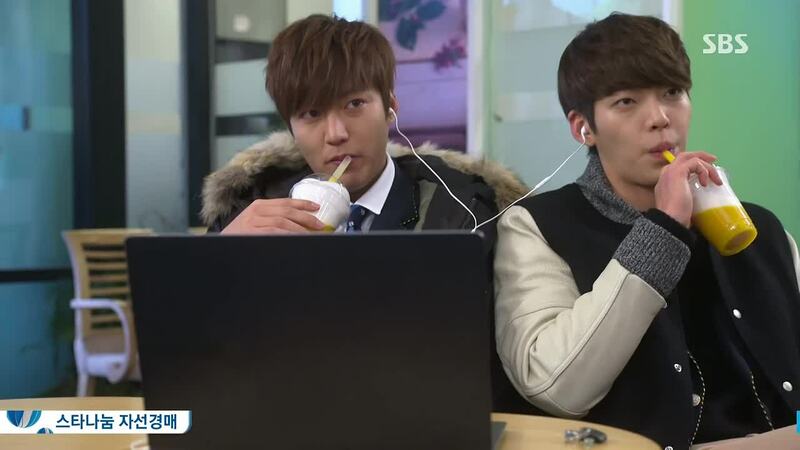 I’ll definitely be watching out for more of LMH, KWB, PSH and KMH dramas. If anyone has any dramas to suggest, please leave a comment below!! Thank you!! 😀 Can’t wait for Episode 16 tonight!! Hi justme,I can sugest you LMH’s dramas:Boys over flower,Personal taste,City hunter (my favorite 😉 ),Faith.I really didn’t watched all the others actors work,just LMH’s,since I’m his fan. 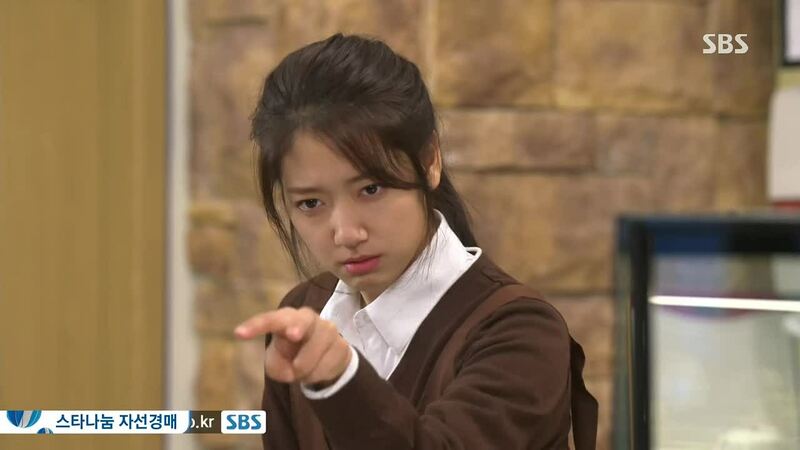 Alina try you are beautiful by psh. its really interesting. By da way city hunter is nice.i watched it. Hi gv 🙂 I did watched (and also I enjoyed)You’re beautiful and Flower boy next door from PSH,but nothing else. I understand how you feel,he’s addictive 🙂 I enjoy other actors work too,but LMH totally won me over. Ya nowadays after watching LMH im immune to other actors. Always prefer repeating LMHs drama than watching someone else. 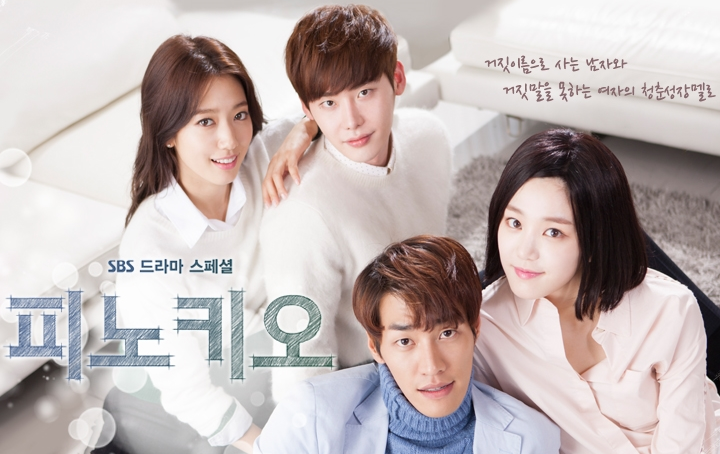 I love ” you are beautiful” by PSH.its really nice. Im sry I dnt know about other two actors. I watched several cute ones: My Princess and Master’s Sun were light and very entertaining, plus the leads were both handsome – very. You will enjoy watching them. Also, another one by Lee Minho, about a house. Can’t remember the title now, but he was an architect. Nice story too. Happy watching! Hi again, the one I couldn’t recall is Personal Taste. At least that’s the title in my country. He’s really eye candy – but then again (if you really want to watch a man that looks manly – there’s also Song Seung Hye….sigh…be still my heart…looks manly with looooong lashes…ooooh! He is the dignitary in My Princess. Such a cute story! The OST8 is out the song that everybody was looking for is out and it’s called : Only With My Heart (마음으로만) Park Jung Hyun . Omg, why is kim tan.crying in front of Eun Sangs locker? Omg im worried. I think is because he finds out what his father wants to do (send her away)and maybe she has emptyed her locket already ,preparing to be send away.or maybe he sees what the kids put in her locket(the scene from preview,in witch we saw she has garbage or something like this in her locket). Alina…Thank you! Thank you! I hope someone really steps up to daddy Kim. You’re welcome 🙂 and I hope for the same,that man needs and deserves a lesson or two,he’s horrible. ES choose the second option which is the worst, she can be with KT for two weeks but she will be forsaken somewhere she even don’t want to go, which is the worst cause its unknown. How can he do it to her, what about her mother? Can she just hide after its all over? I feel so sad for both f them. How can this be true? 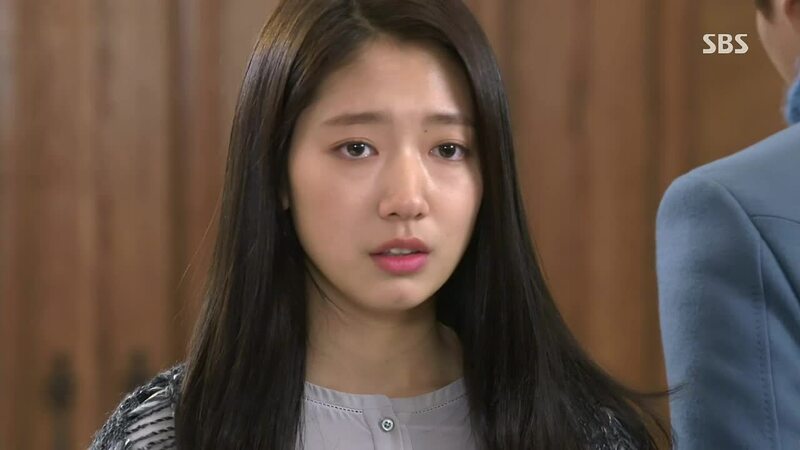 What will happen to ES now that she is not at KT’s home and exiled from Jeguk High? How come she can’t do anything to tell KT about it? I am scared for her and for her mother! I saw the photos of the new episode, I got so sad to see Tan like that 😦 I guess he found out about what his father did, I truly hope it’s not because ES already left, it’s too soon! @Vala I feel like going crazy too if ES will be exiled somewhere where she don’t even want to go. I hate KT’s father! How can he do this to his sons? Did he even loved them? He said he gave KT all the majority of his shares for His birthday but its not actually for him, it’s for Jeguk Empire’s advantage. As the investors keep buying Jeguk Empire stocks, and both brothers fight for the ownership, the unstable future of Jeguk Empire is at stake. No matter what happens since KT’s the major stock holder, the share holders will make him lead the company cause Won has broken their trust since he and his father lied about KT’s identity. Still Jeguk Empire will remain one of Korea’s best business empire. When Won said you lose your guard on protecting ES from all this madness, he means KT should have known about this fiasco. But since KT is now own majority shares of Jeguk Empire he can sell it or buy out everyone to help find ES and save her from this nightmare. 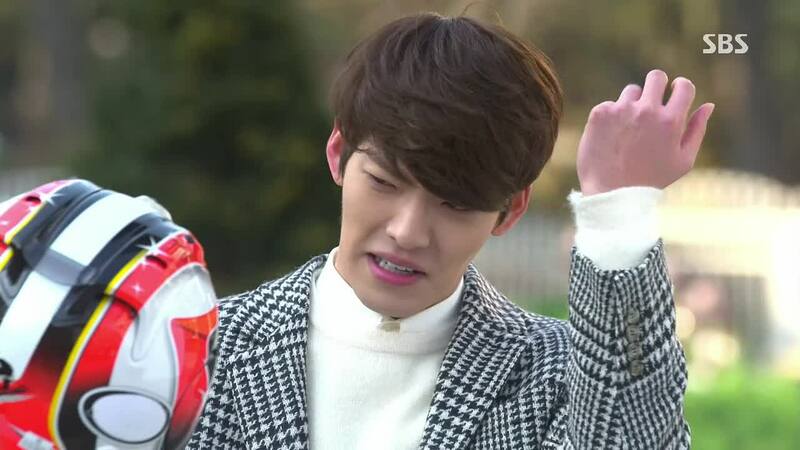 Thinking that its already ep.15 makes me sad .. Theres only 5 episode .. Aish ! I can’t wait to watch the next episodes. One of my most favorites drama of all time. Keep up the good work jooni. When YD tells ES he’s not her friend, I lol because YD realises that if he accepts to be her friend, he would end up friendzoned. And there’s nothing worse to a guy than being friendzoned. please tell me how can i find the soundtrack. 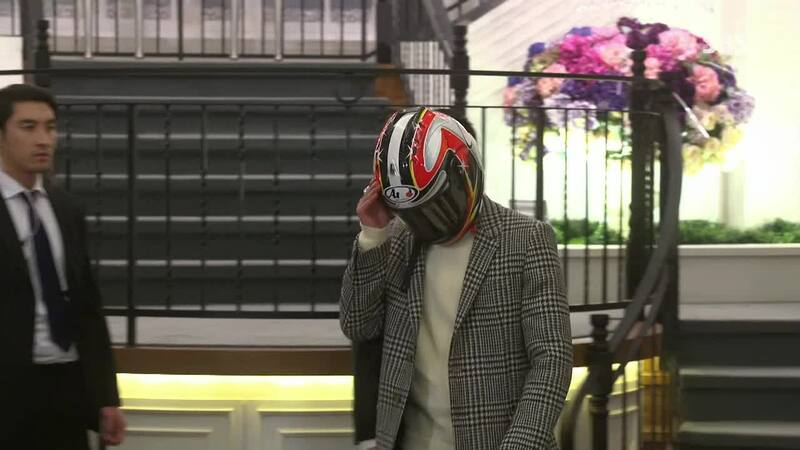 when YD comes out of the room with his helmet the drama plays that music in episode 15.and that soundtrack played in episode 9 during the KIMTAN and YDs fight.please tell me how can i find that soundtrack??????????????????????? ?